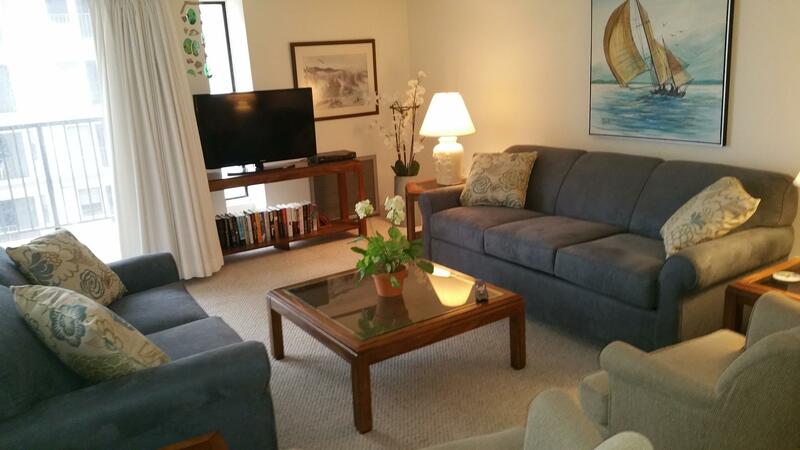 Rehoboth Beach Vacation Rental – Henlopen Unit 603 | The Henlopen Rehoboth Beach Rentals. Rehoboth Beach - Décor is soft and colors are soothing in this courtyard unit just one back from the oceanfront units. Good ocean view and lots of room to enjoy your vacation. Building-wide Wifi. Beds: 2 doubles, 2 singles, queen sleepsofa Max. Occupancy: 6 Satuday rental. NO SMOKING. NO PETS. The Henlopen Condominium in Rehoboth Beach, DE is an ocean front building located at the northern end of the boardwalk; Less than 0.4 miles via boardwalk to Rehoboth's famous downtown restaurants and attractions. The Henlopen Condominium offers you a relaxing vacation with wonderful amenities such as: Building-wide WiFi, an outdoor rooftop pool, outside shower, and easy beach and boardwalk access. Book this great unit or call us to book it!